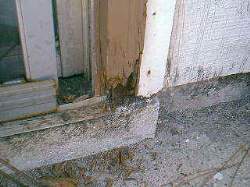 I live in Orlando, Florida and the side of my door jamb has Dry Rot. What causes this and how do I fix it? Dry rot is a fungus that destroys wood and can happen from consistent moisture containing salts from rising ground water. Basically, ground water keeps creeping up the side of your door jamb. The ground water contains salts such as chlorides and nitrates and every time it creeps up the jamb, it leaves salt deposits when the water evaporates. The salts become acidic substances every time more ground water washes over it. The wood ultimately became brittle and rotted out. I would take close inspection of your 2x4 frame. If there is rot, you will need to replace the 2x4s with pressure treated wood. If there is no structural damage to the frame, the rotten wood should be scraped away from the door jamb and treated with epoxy wood hardener and then filled with epoxy. If there is damage to the structural door frame, then the rotted wood should be scraped away and the bottom portion of the jamb should be removed and replaced with pressure treated lumber. Fill any gaps with siliconized acrylic latex caulk, then prime with oil based paint followed by latex exterior paint. re-grade away from the door to prevent the rising damp from happening again.